More than a dozen companies responded to a recent request from Comptroller Glenn Hegar for input on how Texas should set up a planned gold bullion depository. Major international players in the precious metals industry — and some local upstarts — are hoping to get a piece of Texas’ plan to launch an official state gold bullion depository, and the wide range of pitches they're making suggests even basic details of the project remain up in the air. More than a dozen companies responded to a recent request from Comptroller Glenn Hegar for input on the first-of-its-kind project. Gov. Greg Abbott signed House Bill 483 in June, directing Hegar to set up the country’s only state-run bullion depository. State Rep. Giovanni Capriglione, R-Southlake, began pushing the idea in 2013 but was only able to draw enough support from other lawmakers by requiring that the private sector run the depository and charge fees to cover its costs. "With the passage of this bill, the Texas Bullion Depository will become the first state-level facility of its kind in the nation, increasing the security and stability of our gold reserves and keeping taxpayer funds from leaving Texas to pay for fees to store gold in facilities outside our state," Abbott said when he signed the bill. With few firm details in place, the project is drawing a wildly eclectic range of proposals, some more ambitious than others. Yet some larger corporations, including armored car giant Brink's, argued that the state doesn’t need to build anything to launch its depository. “Brink’s has several secure branch locations in the State of Texas so we would look to utilize existing facilities to provide the vault storage services,” the company wrote in its response to Hegar. Las Vegas-based Anthem Vault proposed “multiple vaulting locations throughout Texas to enable all Texans access to their bullion within a reasonable distance from their homes.” The company also offered to set up a network of “coin shops and retail storefronts” to accept deposits on behalf of the state depository. Some supporters of the Texas depository have framed it as a challenge to the U.S. Federal Reserve's control of the U.S. dollar, a view with a long history among the state's grassroots Republicans. Former Texas Congressman Ron Paul is often viewed as the leader of a national campaign to have the United States return to the days when the dollar was pegged to the gold standard. At Wednesday’s Republican presidential debate, U.S. Sen. Ted Cruz made a similar suggestion. "I think the Fed should get out of the business of trying to juice our economy, and simply be focused on sound money and monetary stability, ideally tied to gold," Cruz said. Several of the submissions to Hegar's office suggest that some companies are infusing their visions of the Texas Bullion Depository with unique political views. “We here are in full support of Texas and their efforts to restore and defend our Constitution of this Republic to these United States of America,” wrote PMB&V of Spokane, Washington, which markets a Precious Metals Access Debit Card. Texas Precious Metals predicted the depository could serve as “a unique alternative to the federal monetary system” in the event of a banking crisis. 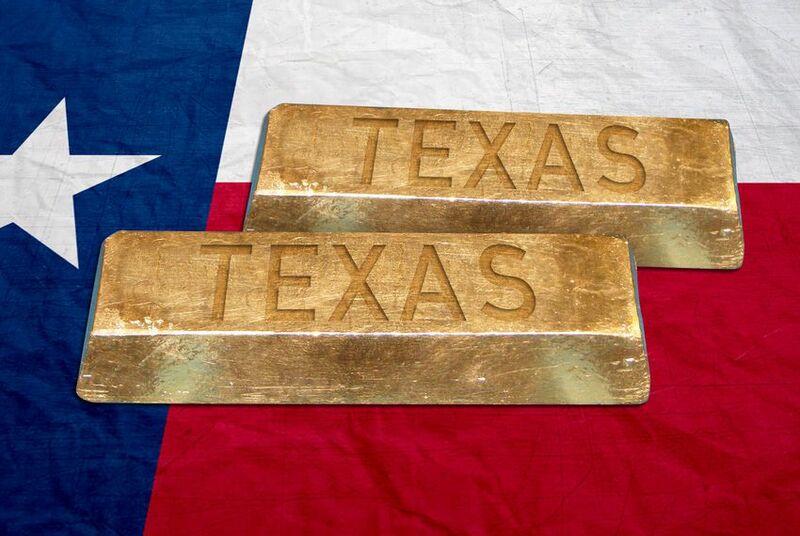 “Any attempt by the federal government to tax gold bullion within the Texas Bullion Depository would, as is the case with confiscation, effectively nullify Texas’s constitutional monetary obligations,” GoldMoney wrote. Hegar’s office is still evaluating the responses, according to spokeswoman Lauren Willis. Eventually, the agency is expected to issue a formal solicitation for bids on the project, detailing more fully what the state envisions. The gold bullion at issue is actually worth only $647 million and is owned by the University of Texas Investment Management Company, which oversees the assets of both the University of Texas and Texas A&M systems. UTIMCO currently pays about $647,000 a year to store the gold at the HSBC Bank headquarters in New York City, according to UT System spokeswoman Jenny LaCoste-Caputo. The new law does not require UTIMCO to move its gold to the state’s depository. UTIMCO has said it will only do so under two conditions: that it cost less to store the gold in Texas than it does in New York and that the depository is a member of COMEX. The Chicago Mercantile Exchange, also known as the CME Group, did not respond to a request for comment. Hegar’s office has not reached out to the exchange, Willis said. Several companies told Hegar they were skeptical that the Texas depository could ever gain membership in COMEX, which currently requires that all its licensed gold depositories be located within 150 miles of New York City. “Texas may be too far outside that mileage parameter, unless the State of Texas can make provisions for exceptions with these organizations,” a U.S. subsidiary of Switzerland-based Loomis International wrote. Some warned that Texas taking on UTIMCO’s gold might not be a good deal for UTIMCO. A possible compromise solution came from a U.S. subsidiary of Hong Kong-based logistics and storage firm Malca-Amit, though Texas lawmakers aren’t likely to welcome it. “Should the state of Texas wish to establish a COMEX gold vault, in order to expedite the process, Malca-Amit would happily operate that vault within NYC on behalf of Texas,” the company wrote.